It's that time of year, when the sun finally escapes the cloudy blanket of winter, and people begin to dream of traveling to far off places. That's how it began for me, anyway. Frustrated with my first job out of college and ridden with wanderlust, I began to research options for traveling the world on the cheap. Of course, it was kind of a joke at first, just wishful thinking. Then wishful thinking turned into obsessive research, which turned into me packing a suitcase and flying to France for a year abroad. Spring is also the time of year when host families begin to look for their au pair for the next school year, so I thought it would be an appropriate time to do a little FAQ on being an au pair in Paris. I discovered there aren't many resources out there on becoming an au pair, so I hope this post will shed some light on the subject and hopefully inspire some of you to take the big leap of faith and go for it! If you still have more questions about being an au pair, post it in the comments section, and I will answer as best I can! Note: This article is aimed at Americans looking to au pair in France. If you are European, congratulations! Your life is enormously easier in regards to paperwork and travel. So disregard the bit about consulates and visas. 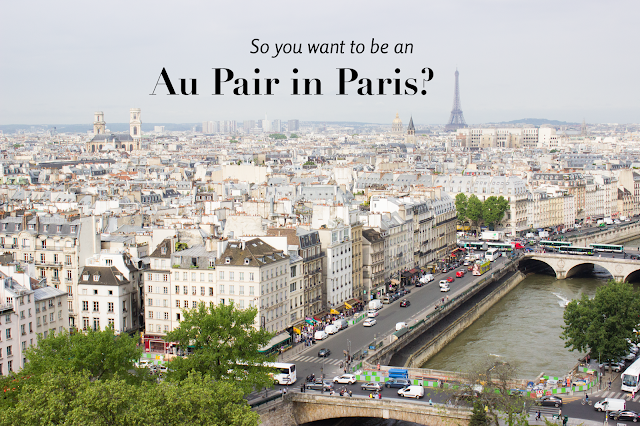 First, let's start with the obvious: should you be an au pair? Do you want an immersive cultural experience, or are you just craving a really great vacation? Do you need a change of scene or a change of country? Do you enjoy spending time with children? All important factors to consider before committing to move abroad for a year. An au pair job is not like backpacking around Europe, which is not like cruising through the Mediterranean, which is not like working on an organic farm in Australia. I chose to be an au pair firstly because I wanted to learn French, secondly because I wanted to live abroad as a local, and thirdly because I wanted a regular place to come home to, and regular people to share life with. I have worked with kids throughout my life, and while I'm not planning to make a career of it, I knew I could handle hanging with a few kiddos for a year. Being an au pair is a common and reasonable gap year choice if you've just finished high school or university and aren't quite ready to jump into the "real world" yet or need some time to figure out what to do with that shiny new diploma. Do you fit the specific legal au pair requirements for your chosen country? In France, for example, you must be between 18-30 years old. You also must have a basic knowledge of French (kind of...more on this later). And you must have finished at least a high school level education. There are two camps of au pairs: agency and independent. Some au pairs prefer to pay a fee and let an agency find a family for them and handle the paperwork process. Other au pairs (like me) would rather use that agency fee on a trip to (fill in dream country here) and choose to find a family and do the paperwork themselves. Trust me, it's not as daunting as it seems. Note: I cannot personally vouch for these agencies, as I did not use them. But they are the most popular amongst my friends here who went through agencies. Most of my friends and I found our jobs using Aupair World. It was the least dodgy and is the easiest to navigate. Plus lots of great resources to walk you step-by-step through the process. A note on writing your profile: my host mom (who has had 15 au pairs) told me that she never considers anyone whose application is not written in a professional tone. Remember that not only are the French more formal, but these are parents entrusting their children to a foreigner whom they've never met. So make an effort and write your profile with some class. What kind of job should you look for? In the au pair world, there is an idea that every job is a triangle of benefits: location, family, and perks. Pick your top two, because getting all three is rare. For me, I knew if I hated my family, the other two wouldn't matter. And I wanted to live in central Paris, not in the suburbs or a small town in France. (Most au pairs who live outside the Preferique--the circle of highway that defines central Paris--make fewer friends and see less of the city then other au pairs.) Lastly, I happened to also get some great perks, but that's what you get with a seasoned au pair family. If you are the family's first au pair, your expectations should be more flexible. Sound too good to be true? I found a job like this, and I know other who have too. You won't get everything on this list, but see how closely you can negotiate. Maybe you babysit one weekend a month, in exchange for Internet on your phone. Always stay flexible, but know what you need and what you don't. Right now, you will want to square away all your official documents. Birth certificate, passport, drivers license, school transcript. You won't want to be waiting around for this later on in the process. Basically there are two essential elements of your au pair application. The au pair contract and the au pair visa. Do not accept an au pair job without signing a contract with the family. Every au pair I know who has started without a contract has gotten royally screwed over. You and your host family must both sign it. Your family then gets this contract registered and approved by the French immigration office. This has to happen before you can apply for your visa. The au pair visa allows you to work and stay legally in France. You must apply for this in person at your regional French consulate. This requires a dossier (file) of paperwork that isn't too hard to figure out. But it's important to have it all right to make the approval go as quickly as possible. See your specific consulate website for the dossier details. What's a reasonable timeline for all of this to take place? April is when host families begin to look for au pairs, and au pairs create profiles with an agency or online. May is for interviewing and drawing up a contract. Since the contract must be signed by hand, copies must be mailed to France with your signature, signed by the host parents, then and signed and stamped by the French immigration office. (Signatures are a big thing in France, apparently.) The contract is then mailed back to you for your visa application. This mailing back and forth could take weeks, so allow the full month of June for this. Next, you need to make an appointment with your regional French consulate in the beginning of July for your visa to definitely get back to you by August. The consulate's policy is 3 weeks, but if there are problems, you will want time to sort it out. Most au pair jobs begin mid-to-late August. Mine didn't begin until September, which gave me time to put in my two weeks at work after I had my approved visa and then have two more weeks to spend moving out of my apartment and spending some last moments with friends and family. Those few extra weeks made the whole process so much easier, so get ahead of the deadline if you can. The question I researched the most and found the fewest answers on. This all sounds great, but what's the bottom line? Here's my best breakdown. Since you will be living with free room and board and have your weekly pocket money, you will have virtually no living expenses during your time abroad. Sound amazing? It is. But you will also want to go travel and eat fancy French food and buy pretty French clothes and don't get me started on the French flea markets; this might exceed your weekly stipend (okay, it definitely will). So it is wise to have money put away for spending on special trips or celebratory nights out with friends. This totally depends on your spending habits. I personally committed to saving my weekly stipend and using that for all my trips, which usually come out to around 300-400€ per trip (international flight). A nice dinner out in Paris will run you 40€ with three courses and wine. But those are just estimates. You must pay for your plane ticket to and from your home country. I bought a one-way ticket from Columbus to Paris for $635 in the first week of September from American Airlines. I bought it just a month before I left because I wanted to wait until I had my French visa and my travel rewards credit card. So if you can plan further ahead, you could possibly get an even better deal. Something to consider: baggage fees. I got a great ticket price, but it limited me to one 50 lbs suitcase and a carry-on for moving abroad for a year, or a $100 fee for a single ounce more. So if you will be bringing a lot, choose an airline with a good baggage deal. You must also pay for your trip to your consulate, which may mean a short plane ride and overnight hotel depending on how far it is. My sister happens to live in Chicago where my regional French consulate is, so... ROAD TRIP! If you aren't so fortunate, plan that expense too. Then there is the expense of the visa itself, which I believe ran me a solid $150. And don't forget the little stuff that adds up, like new luggage, express mailing something to France, stocking up on essentials and foods you will miss, shoes for traveling, etc. All in all, it might be wise to have a couple thousand dollars laid away to cover the expenses of the entire transition. Do I have to know French? The requirements for an aupair in France are that you have a basic working knowledge of French before you work as an au pair. Now I will admit, I didn't have a basic working knowledge; I didn't have any knowledge! I had tried Rosetta Stone, podcasts, phrase books. But I was still limited to bonjour, au revoir, merci, and je suis célibataire. I even met with the French professor of my old university to have him analyze my language skills in case I needed paperwork authorizing my level of French, which he kindly exaggerated was "barely survivable" at best. But there is, in fact, no "proof of language skills" test or anything like that. In fact, the only reason that is a requirement is for the au pair's own sanity as she begins her French courses or speaking with the family (some au pairs only speak French with the family). I found a bilingual family, so the language barrier was no detrimental problem to my time in Paris, despite me having never taken a French language course. Won't my career path suffer? I have so much to say on this that it would require a completely different post, but know that, in brief, spending a year abroad adds incredible worth to your whole personhood. The people who see and recognize that worth are the people you want to work for. And about those people who think you wasted a year, do they really align with your work philosophy anyway? It is becoming ever more common to see a gap year on a resume after university for travel or volunteer work around the world. Don't be afraid to jump off the treadmill. I repeat, DO NOT BE AFRAID. What will I be missing out on if I go? You will realize, several times, how everyone's life goes on without you. You will miss weddings and births and deaths. You will miss out on being in those crazy photobooth shots from the Fourth of July party. You will miss out on big national events like the Super Bowl and Voting Day. You will miss out on traditions with family during the holidays. You will miss out on knowing exactly what is going to happen from one day to the next. What will I be missing out on if I don't go? You will miss this narrow window of opportunity to see the world while you are young and healthy and free of responsibility. You will miss the chance to learn a new language that will open doors to a whole new group of people worldwide. You will not travel the world so inexpensively ever again (there are tons of benefits for young travelers in Europe under the age of 26). You will not taste weird foods and hear strange sounds that eventually work their way into your daily routine. You will miss the opportunity to see your world and yourself from the outside. You will miss out on having an international posse of friends. But most of all, you will miss out on discovering a new version of yourself you never knew existed, someone waiting on the other side of the gorge, waiting for you to have faith enough to jump, waiting to introduce you to who you were meant to be all along. I hope this FAQ has been helpful, and I will be adding to it as I receive more of your questions. In closing, this year as an au pair in France has been the best decision I have ever made, and I hope if this opportunity speaks to you, you will not hesitate a moment to seize it. Congrats on finding a job as an au pair! You are going to learn so much during your time abroad, truly a time you will never forget :) As you are a citizen of the EU, you will not need a visa to work in another country in the EU. The paperwork part in this post is particular to American citizens. Thanks for reading! none of the 'essential paperwork' is necessary if you're European, along with the costs that come with it. Also most people I've met (including me) haven't had a contract and have been just fine. So it's not always worth worrying about - my family have been especially amazing. Also I disagree with the suburbs comment - I've seen equal amounts of Paris than my inner-city friends and have made more friends than them also. It depends how eager you are to make friends in the first place. There are also benefits to living in the suburbs so I wouldn't put people off from living there if they have found a family they love. Thank you for your great insight. I always appreciate when readers take the time to comment. I have made a note about the paperwork part, thanks for pointing that out. The contract is part of the legal process of working as an au pair in France, although there are some au pairs who opt out of having one. This is much easier if you are already in the EU, as well. But I always think, better safe than sorry! And, of course, everyone will be different in their preference for location, but it's helpful for au pairs to hear some of the potential limitations living in the suburbs may pose that they don't initially anticipate or may not know before coming. As always, it is what you make it! Thanks for reading! Hello! I'm in the process of gathering all of my files for my host family to take into the office of immigration. I'm having a hard time finding anywhere the specifics of what they require for school documents. Is it both my highschool and college transcripts? or will just my highschool suffice? (I already have that, and the college one takes a week or so to get + $$) Thank you! Great questions! You just need a copy of your diploma, either will suffice. I had the worst time with this because, I'm (*ahem*) not a very organized person and managed to lose both diplomas... so I had to do a transcript. But if you don't have your college paperwork yet, your high school diploma will do just fine! Thanks for reading, Allison! I'm excited for you to begin this adventure. Do You Lose Weight in Paris?